Reblocking is a process developed by Shack Dwellers International (SDI) that is based primarily on the spatial reconfiguration of shacks in informal settlements (SDI 2012). Shacks are rearranged and reconstructed to maximize open space in the settlement. Shacks are also often built on raised platforms and the settlements graded to prevent flooding. Reblocking is considered an in-situ process due to its minimal disruption of resident’s lives throughout the duration of the project. Reblocking is only made possible by the commitment and manual labour of community members where reblocking is occurring, a very bottom up strategy. In the case of Cape Town, South Africa, reblocking is made possible by a multi-stakeholder partnership comprised of Non- Governmental Organisations (NGOs), Community Based Organisations (CBOs) and the City of Cape Town. The Informal Settlement Network (ISN) is a CBO comprised of informal settlement residents from across South Africa, who identify and mobilize communities to be reblocked, and provide support during the process. Community Organisation Resource Centre (CORC) is a support NGO who provides financial and technical support to both the partners and community. CORC, in collaboration with the community, purchases the siding material for each structure through another organisation, iKhayalami. The City of Cape Town provides the remainder of the shack materials through standard issue fire kits, and is also responsible for the installation of hard services, such as water taps and toilets, after reblocking is finished. Through the Extended Public Works Program, the City of Cape Town hires community members to implement the physical reblocking in conjunction with outside contractors. The result of this partnership is a settlement organised into neat rows and clusters with improved shacks and installation of hard services available to every community member. In Mtshini Wam, we witnessed this reblocking process along with the challenges and benefits involved. We observed clear benefits with respect to fire safety, establishing roads, reducing grey-water hazards, creating jobs and inspiring a sense of pride within the community, all discussed below. New fire-resistant metal structures, coupled with the creation of space between rows of shacks, greatly reduce the risk of fire. These spaces are specifically designed to allow the passage of large emergency vehicles. The community’s soil compacting efforts and introduction of grading to the settlement appeared to reduce the amount of standing water after rainstorms. When we arrived in Mtshini Wam, there were large pools of grey-water in the un-reblocked clusters that children would play in, while the pools made walking through the settlement a challenge. During the demolition of old shacks, grey-water could be seen pooled underneath residents’ shacks, often with rats present as well. The compacted platforms created for reblocked shacks to stand upon prevent this pooling and have reportedly kept rats from burrowing under community shacks. 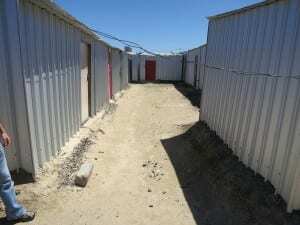 Living conditions are greatly improved in reblocked clusters and shacks, which are noticeably less damp. Community members told us that they feel healthier since this change in their living conditions. There is also a shortage of services present in Mtshini Wam as only three taps and 16 chemical toilets service 497 people. During our time in Mtshini Wam only one tap consistently worked. The chemical toilets are cleaned infrequently and due to the sheer volume of people using them, they are unpleasant to use and a health hazard. The previous arrangement of the original shacks made installing personal taps and flushing toilets nearly impossible. However, the order that reblocking introduces to the settlements eases some of the difficulties in service provision. The government has promised a tap and flush toilet per shack in Mtshini Wam. While technically challenging, this would be a quantum leap forward from current services, and is made potentially feasible through reblocking. Read about our Cast of Characters.